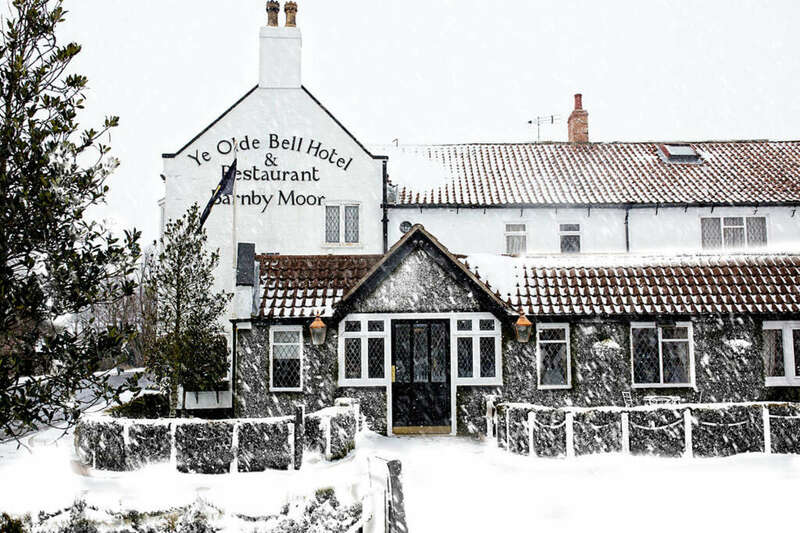 Read our review of Ye Olde Bell Hotel & Spa, a homely and traditionally English hotel located on the borders of North Nottinghamshire, Yorkshire and Lincolnshire, offering 59 beautifully styled bedrooms, AA Rosette cuisine and a super luxury spa. Ye Olde Bell Hotel & Spa is the perfect place for a weekend of relaxation away from the office. The main hotel building is all about classic interiors – as soon as you enter the snug and the reception area, you’re greeted by plush fabrics, elegant wallpapers, moulded Lincrusta wall coverings, oak panelling and antique furnishings. Once checked in, cosy up there, next to the flickering log fire, and flick through the day’s papers while sipping on a nice cup of tea. All of the hotel’s 59 rooms are atmospheric and beautifully styled and come in five categories. For a real taste of luxury, stay at one of the suites or better yet – book one of the two 2-storey lodges which are set just off the Courtyard. The short walk between the hotel and the spa takes you to a very different setting. Opened in 2017, the multi-million pound spa feels like it belongs in a resort somewhere in the Alps and not in a traditionally English inn. And with its truly impressive collection of experiences to try, it guarantees to make your shoulders ease as soon as you arrive. The main entrance leads you through the kind of lounge you want to luxuriate in, with its contemporary design, cosy fireplace and velvet armchairs. Once in the spa itself, you’re welcomed by a sublime pool that runs both inside and out and comes with in-built relaxing loungers and various hydrotherapy features. By the outdoor side of the pool, you’ll find three cosy Alpine lodges with fire pits where you can cuddle up and relax. Don’t spend too much time there though because the real fun is inside. Make sure you try the stone bath and the two saunas, which offer different heat options and experiences and go straight to the shower walk after you’re done. Its settings include waters of varying temperatures and sounds which recreate the experience of a warm tropical rain and summer storm, a cold Alpine rain or a mist and end with a cold bucket shower. If the bucket shower sounds too scary to you but you still want to have a cold shower after a sweat session, try the snowstorm experience. Ye Olde Bell spa also offers a herbal steam room, infused with herbs from their very own herb garden and a Salt Inhalation Room where you can have a relaxing nap. When all that relaxing gets too much, move to the spa restaurant for a beautiful three-course meal (and try their gnocchi salad with rocket, sundried tomatoes and pine nuts). And if you want to leave feeling truly revitalised and rejuvenated, top off your spa day by indulging in a Turkish massage or an aromatherapy facial in one of Ye Olde Bell Spa’s six treatment rooms. Let me warn you though: with glasses of prosecco constantly flowing (brought to you by very helpful spa butlers) and the abundance of things to try, leaving the spa to go back to the hotel and get ready for dinner could be a very difficult task. Dinner (and lunch) is served in Restaurant Bar 1650 and St Leger Bistro-by-the-Bar, both of which have been awarded an AA Rosette. Menus feature classics such as steaks, pan seared sea bass and venison loin, all celebrating creative cooking and modern British cuisine. The guests of Ye Olde Bell are also invited to join them for a traditional afternoon tea with a contemporary twist (served on beautiful vintage china) or a mouth-watering Sunday roast. With its impressive six banquet suites, Ye Olde Bell is also renowned for its wedding, banqueting and corporate events – and we’re struggling to think of a better place that will cater for your event if you’re in the area! A stay at Ye Olde Bell Hotel and Spa, which includes spa time, starts from £149.50 per person. For more information or to make a booking visit www.yeoldebell-hotel.co.uk or call 01777 705121. Your description is right! Traditional and modern style!